If there is one industry none of us can claim to live without, it is that of food and drink. Good culinary experiences are an enormous part of our lifestyle and culture, and of course, keep us alive. However, in recent years there have been concerns about the future of our food. Widespread animal diseases, and the worsening British weather means farmers are finding their own livelihood, and that of their animals, at risk. With this in mind, how can Virtual Reality offer farmers a new dimension of help? With the UK population expected to rise by over 4 million people in the next decade, the number of additional farmers who are needed to continue to cultivate, harvest and manage our food is growing. Fast food giants McDonalds have taken on the task, by creating The Progressive Young Farmer campaign, which hopes to educate and encourage the new generation to get into the industry. Using Virtual Reality (VR) the organisation have built an immersive video which shows the general public exactly what goes on inside a farm. Working with McDonalds are three tech-savvy young farmers who helped launch Follow our Foodsteps. This 360 degree, 3D footage takes apart the process of the food that ends up on our plates, giving information on how it is grown, produced and prepared, all in VR. One of the most powerful aspects of VR is its transportation-like visuals. The combination of high tech hardware and well filmed, photographed or designed software imaging means it is possible to replicate anything, anywhere in the world. Food and drink brands can use this to upgrade standard factory tours for the general public. Whereas currently users can pay for a walking tour inside the factory or packaging facility, there can be risks of compromising strict hygiene regulations. Instead the same experience can be offered to anyone from the comfort of their own home, using a VR headset like the Google Cardboard. Moving from customer entertainment to customer heath, we’ve already seen VR being used by healthcare professionals to improve overall medical experience and efficiency, but what about individual health concerns? Currently the NHS spends more than £4 billion every year on obesity and despite all efforts, people are still finding it difficult to manage their own weight. 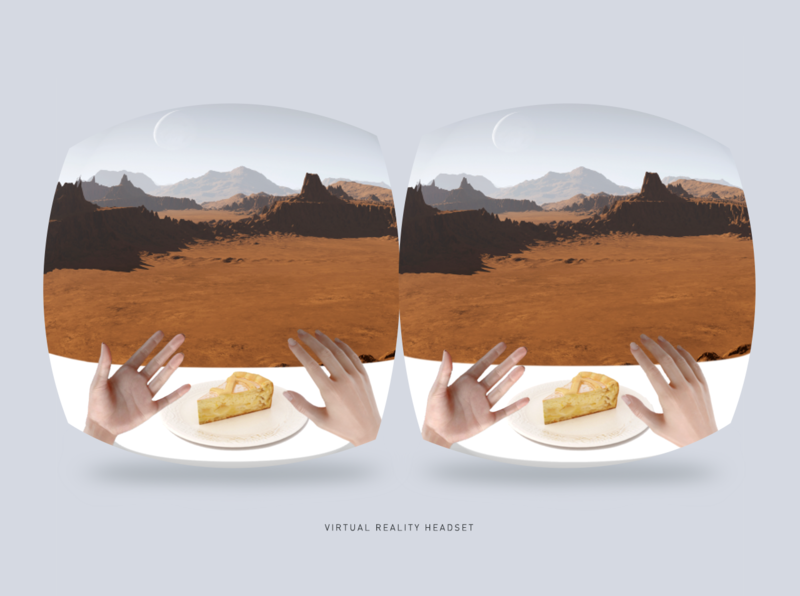 Technology think tank Kokiri Lab has created Project Nourished, a gastronomical VR experience which offers good food without the calories. The system is based around Facebook’s Oculus Rift headset, situating the user in a preferred dining setting, with food appearing on the table. The user is then given cutlery attached to sensors, which mean they can be tricked into eating a low-calorie food substitute. The food given actually contains minimal calories yet attempts to replicate delicious dishes like burgers, sushi and steak. Additionally, aromatic diffusers are used to trick the nose into thinking it smells a different, tastier food, to the one actually being eaten. There are currently a few issues with the VR systems, but these are likely to be smoothed out over the next few years as the technology develops. The tracking technology has yet to accurately monitor hand movement, so the motion replicated as a user eats can often be out of sync, breaking the illusion of dining elsewhere. The current best headsets on the market are also heavy and require large hard drives attached to multiple wires, so a user may find themselves restricted physically, which isn’t preferable when trying to enjoy a steak dinner. VR’s ability to fool the mind is also being tested by Samsung, who have been creating a series of dining experiences for their Gear VR. 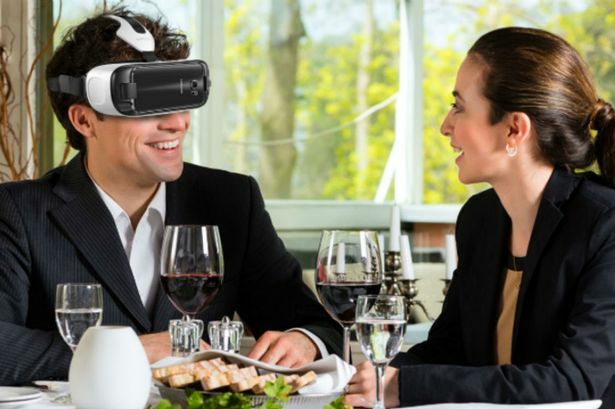 There is unlimited potential, as anybody, anywhere, can eat their meals wherever they like using a VR headset. This means a lone diner in a cheap hotel restaurant, or a student snacking on pot noodles, can have a more enjoyable experience. The options are endless, with the choice to eat by a beach while the sunsets, or even under the sea, if that’s what you like. To learn more, keep yourself updated with our weekly feature articles on VR!